Home / Route 304 – Food highway: it’s the new rice and succulent fish season! The abundance and security of our food “from the mountains through the rice plains, to the Gulf of Thailand” is facing a crisis. The farming, forest, and coastal areas of the Bangpakong River basin, which covers five provinces of the eastern region of Thailand (Sakeo, Prachinburi, Nakorn Nayok, Chachoensao and Chonburi) are food producing areas that are linked both to the local and global economies. They are under threat from unenvironmentally friendly development that doesn’t give enough attention to food security, in particular the expansion of industrial zones, power plants, ports and many other industries. Route 304, the highway that links communities to the abundance of natural resources and the vibrancy of culture of farming communities from past to present, is being severed. So in a bid to restore the links from past to present and connect producers to consumers with the aim of preserving food producing areas for the food security of the Thai population and the world (preserving foods which are delicious, safe for consumption, and nutritious), the people of the Bangkapong River watershed held an event marking Route 304 as a “Food Security Highway”. 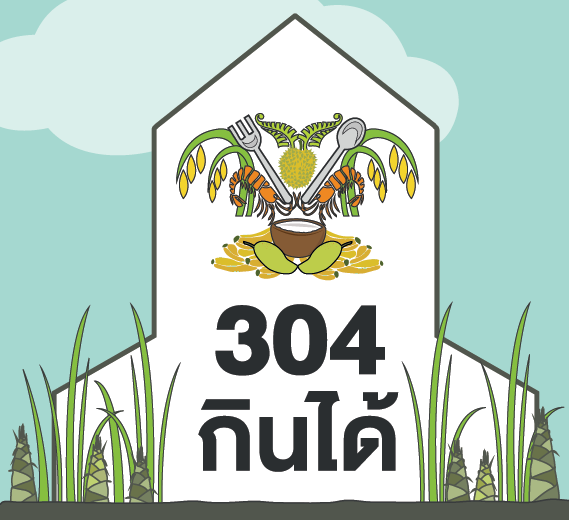 The event was called ‘304 กินได้ ฤดูข้าวใหม่ปลามัน’, which could be loosely translated as “All you can eat at 304, it’s the season of new rice and succulent fish!”. This was held on 18 to 20 January 2013 at the Panomsarakham municipality, Panomsarakham District, Chaochoensao province, inviting people from the watershed area and consumers from Bangkok to take part in protecting this source of food security so close to the capital. At this event, there will be an “All you can eat 304 Treasure map” showing foods from the mountains to the plains to the Gulf, tree saplings from the forests of five provinces of the Eastern region, wild root crops, local tubers, herbal medicines. Get to know the Bangkla Jasmine rice plant which is the origin of the jasmine rice 105 variety which we all know today. Have some Kanom jiin (or fermented rice noodles) coloured with natural herbs and a variety of indigenous vegetables. The organic farmers group from Sanam Chaikeit will be there. Organic shrimps, shellfish, crabs, fish, frogs, from the rice fields of Kabinburi. Learn how to make and taste salts from the last remaining salt fields of Bangpakong. There will be very fresh shrimps, shellfish, fish, along with local produce and many entertaining activities. There will also be a seminar with speakers on food security, as well a competition for farmers who are feeding the Thai people and the world .